Recently we had an early September cold snap and I immediately thought “soup!”. I had some Parmesan cheese rinds in my fridge and had just made some chicken stock, so I thought “minestrone!”. Not sure I’ve ever made it before, but I love soup with lots of vegetables. I have a 1973 paperback of Marcella Hazan’s Classic Italian Cooking, so I started there. 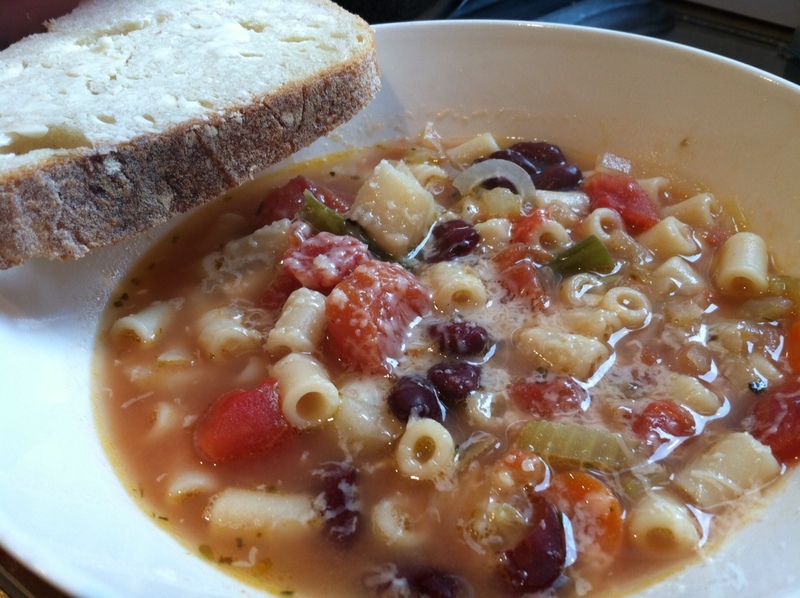 I looked at many recipes for this classic Italian soup – as you might expect, there is no one set recipe. Marcella’s included “meat” stock made from beef for which I substituted chicken stock. It did not include meat as many recipes do. I had some chicken sausages on hand and added those, although I think it would be delicious without. I found her method of adding ingredients to the base one at a time interesting and unique to all the recipes I looked at. (This is probably so you can chop the next ingredient while the previous is sauteing!) This recipe made many meals, so I think it could easily be cut in half to serve 4 people with left-overs. Enjoy with some crusty bread and a Chianti or Valpolicella! Heat the olive oil over medium heat in a large Dutch oven or soup pot. When it shimmers, add the butter and stir to melt thoroughly. Add the onions and saute for about 5 minutes until soft, but not browned. Add each ingredient, garlic through sausages, one at a time and saute for about 2-3 minutes each, stirring constantly. Next add the stock, the tomatoes and their juices, the herbs, salt and pepper, the cannelini and kidney beans and the parmesan rinds if you are using. Adding more or less stock depends on whether you like your soup on the thick or the brothy side. Stir to blend thoroughly. Bring to a boil, then turn down heat and simmer for about an hour. The vegetables will be cooked through but not mushy. When the soup is finished cooking, remove the parmesan rinds. To serve, put a little cooked pasta (if you are using) in the bottom of a soup bowl. Pour the soup over the pasta. Pass the grated parmesan and parsley. NOTE: As with many soups, this only gets better after a day or two. If you want to make this to freeze for future use, omit the potatoes. I’ve found that they turn to mush in the freezer. Cooked cubes of potatoes can be added later.